At Least $32 Million Raised By Michigan Ballot Proposal Campaigns During 2017 and 2018 Came From Nonprofit Organizations That Got Their Money From Somewhere Else. LANSING (Jan. 31, 2019) — A year before voters headed to the polls, a campaign to change how Michigan draws its legislative districts was still taking shape. The campaign sent out a fundraising email in the summer of 2017, touting its large, grassroots donor base. But in the weeks before the 2018 election, two nonprofit organizations that didn’t have to disclose their contributors — one group based in Texas and one based in Washington D.C. — chipped in a combined $11.1 million to support Voters Not Politicians. The group’s ballot proposal to create an independent redistricting commission in Michigan ultimately passed with 61 percent of the vote. About 67 percent of Voters Not Politicians’ money came from the two nonprofit organizations. The financial support for Voters Not Politicians reflects the way dollars from nonprofits flowed to many of Michigan’s 2018 ballot proposal campaigns. According to an analysis of fundraising disclosures, the ballot campaigns and their opponents raised at least $32.3 million from nonprofit organizations that didn’t have to report their own funders. The $32.3-million total amounts to about 70 percent of the $45.7 million that Michigan ballot campaigns and their opponents reported raising over 2017 and 2018, according to the analysis. It includes both direct contributions of money and in-kind contributions of goods and services. While it’s not a new development, the numbers show how little the public knows about the original sources of much of the money behind efforts to enact statewide policies through the petition process, even efforts that have substantial grassroots support, like Voters Not Politicians. 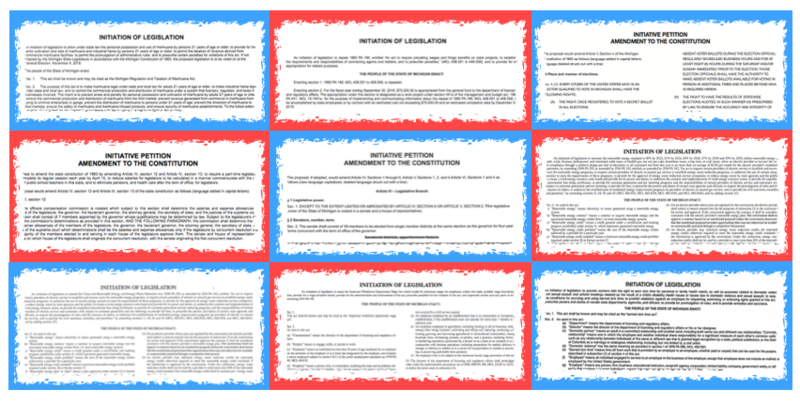 Three of the 2017-2018 ballot campaigns gathered enough petition signatures to place their proposals on statewide ballots. All three garnered enough support to pass their proposals on Election Day. Those proposals changed the redistricting process (Voters Not Politicians), expanded voting rights (Promote The Vote) and legalized marijuana (Coalition to Regulate Marijuana Like Alcohol). Three other campaigns gathered enough signatures for their proposals, but the Legislature stepped in to approve the proposals, keeping the proposals off the ballot. Those proposals repealed the state’s prevailing wage for certain public construction projects (Protecting Michigan Taxpayers), created an earned sick-leave law (MI Time to Care) and increased the minimum wage (Michigan One Fair Wage). For the sick-leave and minimum wage proposals, the Legislature later weakened the proposals by amending the laws they previously approved. Another proposal campaign to make the Legislature part-time, Clean MI, raised more than $1.7 million but didn’t collect enough petition signatures. 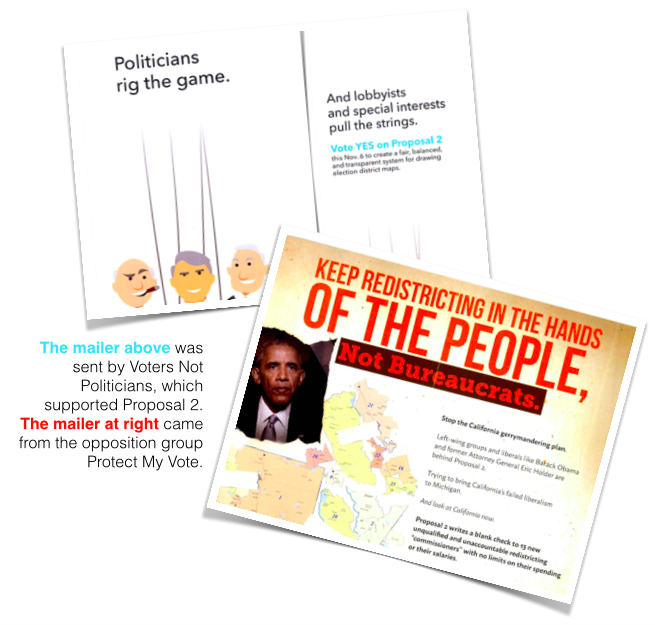 Numerous ballot campaigns raised money to oppose the successful and unsuccessful proposals. The redistricting proposal from Voters Not Politicians could impact the way the Michigan Legislature operates for decades to come. And much of the money in the fight over the proposal came from nonprofits that raised their own dollars from somewhere else. 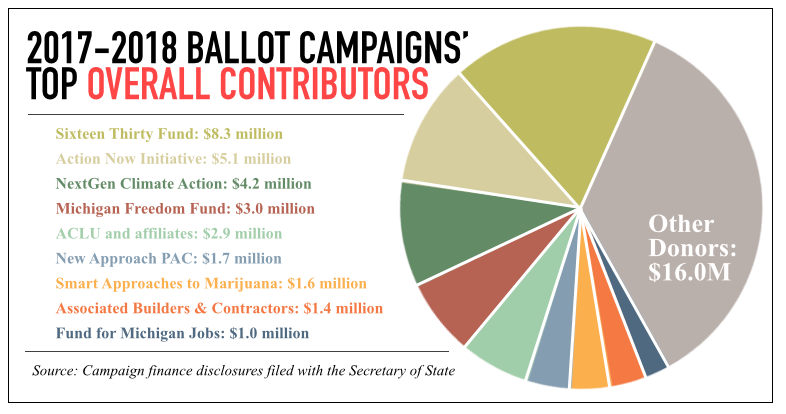 Reporting more than 30,000 individual contributions, Voters Not Politicians had the broadest base of financial support of any of Michigan’s ballot campaigns over 2017 and 2018 by far. The wide majority of its donors were individuals, and the group also collected its petition signatures using volunteers. Most ballot campaigns have to pay signature gatherers to do that work. Still, Voters Not Politicians’ two largest donors ended up being nonprofits that fall under Section 501(c)(4) of the Internal Revenue Code, also known as 501(c)(4)s. Those two groups began contributing to Voters Not Politicians in September and October 2018. Elizabeth Battiste, a spokesperson for Voters Not Politicians, said the investments from national organizations were a "testament to the work of volunteers across the state” who collected the necessary signatures and initially backed the proposal. According to a tax filing from the organization, it supports advocacy efforts “aimed at informing and educating the public at large particularly in the areas of obesity, education, pension and electoral reform.” The group’s board includes John Arnold, a billionaire former hedge fund manager. Sixteen Thirty Fund was the largest single contributor to Michigan ballot proposal campaigns over 2017 and 2018, spending $8.37 million across three campaigns. The group gave $2.12 million to MI Time to Care, the campaign backing the earned-sick leave proposal, and $250,000 to Promote The Vote, the campaign backing the expansion of voting rights. Sixteen Thirty Fund didn’t immediately respond to an email seeking comment. “I think the evidence is clear that Voters Not Politicians, which spent months bragging that it was a grassroots organization backed exclusively by everyday Michiganders, was exposed as bought-and-paid-for with millions from a handful of secret out-of-state special interest groups,” Daunt said in an email. Protect My Vote, the campaign that worked against Voters Not Politicians, received $3.05 million in support from Michigan Freedom Fund, which is a nonprofit itself. The fund and its partner organizations work “to catalyze a grassroots movement in favor of our Constitutional rights,” according to their website. In the past, a political action committee linked to the Freedom Fund has been heavily supported by members of West Michigan's DeVos family. The American Civil Liberties Union (ACLU) raises money from donors across the country. The national group and its Michigan affiliate spent about $2.9 million to support Promote The Vote, the campaign to expand voting rights in the state. The proposal, which voters approved, allows for no-reason absentee voting and straight-ticket voting. Similarly, voters signed off on legalizing marijuana in November. The campaign for legalization was called the Coalition to Regulate Marijuana Like Alcohol. Its second largest financial supporter was the Marijuana Policy Project and its connected organizations. The nonprofit Marijuana Policy Project and the Marijuana Policy Project Foundation, based in Washington D.C., spent about $554,250 in support of the campaign. The nonprofits work to change marijuana-related laws across the country. The anti-legalization campaign was led by Healthy and Productive Michigan. The majority of that campaign’s funding came from Smart Approaches to Marijuana Action, a Virginia-based nonprofit organization that spent about $1.6 million. Proposals that didn’t end up on the ballot also had heavy support from nonprofit groups that didn’t have to report their donors. Clean Energy, Healthy Michigan, which aimed to increase Michigan’s renewable energy standard, received $4.28 million from NextGen Climate Action, according to disclosures. Billionaire hedge fund manager Tom Steyer is listed as the organization’s president, according to a 2016 tax filing. Ultimately, Steyer dropped the ballot proposal after reaching a compromise with Michigan’s dominant electric utilities, according to media reports. Clean MI wasn’t as successful. That campaign aimed to institute a part-time Legislature in Michigan but wasn’t able to collect enough petition signatures. It raised $1.05 million of its $1.70 million from the social welfare organization Fund for Michigan Jobs, which is based in Lansing, according to disclosures. Fund for Michigan Jobs itself reported raising only $78,000 in 2016, according to a federal tax document. Filings for 2017 and 2018 weren’t available online as of Tuesday. However, the public does know about one of the 2017 donors to the Fund for Michigan Jobs. A nonprofit connected to former Gov. Rick Snyder, Making Government Accountable, reported granting the Fund for Michigan Jobs $162,500 in 2017, according a tax filing. Former Lt. Gov. Brian Calley was a champion of the part-time Legislature proposal. An in-depth breakdown of where Michigan’s 2017-2018 proposal campaigns got their dollars is available at this link.